I keep thinking that Texas Central has reached a point where there’s not much that can be done in the Lege to stop them, and events continue to prove otherwise. Dallas-Houston bullet train developer Texas Central Partners LLC said its project could be delayed by a provision added to the Texas Senate’s proposed 2020-21 budget Wednesday, even though the company is not planning on using state funds to build the high-speed rail line. The company said language added to the upper chamber’s spending plan would encourage lawsuits and “is not beneficial for good coordination and planning.” Meanwhile, project opponents cheered the provision. The measure, authored by Sen. Brian Birdwell, R-Granbury, continues to bar state funds from subsidizing high-speed passenger rail projects but would go further than current law. It would prevent the Texas Department of Transportation from helping coordinate access to rights-of-way on state highways for the high-speed rail project until there is a final, unappealable court ruling on the project’s eminent domain authority. Debate over whether Texas Central has the right to condemn land and buy it from unwilling owners has fueled opposition to the project and led to court battles across the state. The new language was added in what’s called a rider to the proposed budget. Texas law allows railroads to use eminent domain to take land for projects, and Texas Central says it is one. But opponents argue that the company doesn’t count as a railroad because it’s not operating any trains — and a Leon County Court upheld that viewpoint in February. Texas Central disagreed with the ruling, citing a previous Harris County ruling in its favor, and said it plans to appeal the judge’s decision. But as the decision stands, the company can’t condemn land in the counties under the court’s jurisdiction, according to an attorney who represented the landowner in that case. Patrick McShan, an attorney for the group Texans Against High-Speed Rail and more than 100 landowners along the train’s route, said there may be a lengthy court battle to settle the disagreement over whether the company can use eminent domain. And that, he said, could stall the project. See here for more on that court case, and here for where things stood at the end of the 2017 session. I fondly remember thinking that if Texas Central survived that session with nothing bad happening they were probably in good shape going forward. Those were the days, I tell you. The Senate budget still has to be approved by the full chamber and then reconciled with the House budget, so there will be opportunities for this rider to get ditched. And then I can make the same foolish prediction at the end of this session and get proven wrong again in 2021. It’s the circle of life, almost. Hard to say how much effect this will have. The planned high-speed rail project from Houston to Dallas hit a big obstacle last week in rural Leon County when a judge there declared the project’s backers did not have authority to force landowners to sell or provide access to properties. Opponents of the rail project on Monday cheered the ruling as a death knell for the line — albeit one that will take years to savor and finalize. “This project cannot be finished without eminent domain and the project is completely off track,” said Blake Beckham, the Dallas lawyer who has represented opponents of the Texas Central Railway project. Company officials said Monday many of the opponents’ claims and the significance of the ruling were exaggerated. “Texas Central is appealing the Leon County judge’s decision and, meanwhile, it is moving forward on all aspects of the train project,” the company said in a statement. The heart of many of the legal fights, and Monday’s decision, center on whether the company is, in fact, a railroad. Backers since 2014 have insisted the project — using Japanese bullet trains to connect Houston and Dallas via 90-minute trips as 220 mph — is a railroad and entitled to access to property to conduct surveys and acquire property via eminent domain. “Texas has long allowed survey access by railroads like Texas Central, pipelines, electrical lines and other industries that provide for a public good and a strong economy,” the company said. Opponents have insisted that since the company does not operate as a railroad, owns no trains and has not laid a single piece of track. it is not eligible for the access. “Simply self-declaring that you are a railroad … does not make it so,” said Kyle Workman, one of the founders of Texans Against High-Speed Rail. The ruling covers Freestone, Leon, and Limestone counties where the line is planned. In previous court cases related to land access in Harris County and Ellis County, the company has been denied access or dropped its request in the face of mounting questions from the court or opponents. “They have lost every single legal interaction,” Beckham said. Texas Central disputed that in a statement. See here and here for some background. We’re still very early in the legal process, with some procedural rulings but nothing decided on the merits yet. It will be years before the courts sort it all out, and nothing will be settled until the Supreme Court weighs in. In the meantime, there will be further attempts by members of the Lege to put roadblocks in Texas Central’s way. KUHF has more. Coming to a Lege near you. Holly Reed, Texas Central’s managing director of external affairs, said the company prefers not to use eminent domain “at all” and would rather work out amicable sales agreements for the thousands of parcels needed to construct the 240-mile project across 10 counties. And the company vows to minimize how much the line will impact the land around it. Given the fierce opposition to the project in rural areas, eminent domain is likely to become a necessity at some point. Texas Central remains embroiled in the ongoing debate about its authority to condemn land. In one Harris County case, a judge agreed the company has such powers. But that same legal question is at the heart of other ongoing court cases across Texas. Meanwhile, a newly elected lawmaker who has long opposed the project plans to file legislation that addresses what he calls “systemic flaws” in state statutes that arguably allow the company to condemn the land it will need. One of Leman’s biggest concerns about the project is that even if Texas Central can use eminent domain, there is apparently no state agency explicitly charged with determining if its plans for high-speed rail would benefit the public enough to warrant condemnation proceedings in the courts. But once upon a time, there was. Kyle Workman, the chairman and president of Texans Against High-Speed Rail, said the company will still face intense battles at the county level. Reed said that Texas Central would like to work “collaboratively” with the counties in order to get the project built and become a “major economic engine” for Texas. Meanwhile, lawmakers will return to Austin for a new legislative session that begins in January. And Leman expects Texas Central to be the target of legislation. In 2017, 10 lawmakers filed more than 20 bills aimed at the high-speed rail line. But for the second legislative session in a row, the project emerged relatively unscathed after bills aimed at hamstringing or killing it failed to get much traction. Leman, though, thinks there could be movement in the regulatory chess game facing Texas Central as he and others file bills next year that try to balance private property rights and economic enterprise. What would upcoming legislation look like? Well, Leman’s playing that one close to the vest. I’ll leave it to you to click over and see what the agency of the past, which may be revived in some form, was. Rep. Leman is the former Grimes County Judge, and is almost certainly the leading opponent to Texas Central in the Lege right now. Whether he succeeds or not, who knows, but I agree this will be a big fight in 2019, and it won’t necessarily break down along predictable lines. Texas Central is getting to a point where it will become difficult to stop them if that is one’s goal, but they’re not quite there yet. Making eminent domain difficult or impossible for them to use would be a significant obstacle. A good long read from the Trib. Private developer Texas Central Partners LLC plans to build a train that will shuttle people between Dallas and Houston in 90 minutes along a 240-mile route roughly parallel to a highway corridor that normally takes four hours to drive. This new link between two of the largest metropolitan areas in the nation — home to roughly half of the state’s 28 million residents — will help create “a super economy” says Holly Reed, Texas Central’s managing director of external affairs. Texas Central sees the line as a mammoth example of a private entity addressing an infrastructure demand that government agencies are increasingly unable to tackle — and a chance to hook Americans on an alternative to highways that’s long connected major cities in Asia and Europe. “There’s no doubt once people ride this train, they will want trains like this to go other places,” Reed adds. The company’s ambitious vision has arrived just as American cities are starting to grasp the detrimental side effects and financial unsustainability of car-centric infrastructure that’s dominated urban planning since the end of World War II. Texas Central officials say they have raised and spent at least $125 million, of which at least $75 million has come from Texas investors and individuals. In September, the company announced that it secured an additional $300 million in loans from two Japanese entities. But before Texas Central can create an interstate high-speed network in the United States, it’s got to prove high-speed rail is viable in Texas. Even as the company pushes forward with development — and brings on construction and operations partners — it faces daunting hurdles. The company is embroiled in legal and bureaucratic debates about whether a private company can use eminent domain, a process that allows entities to condemn land it needs for a project and forcibly buy it from owners who aren’t willing to sell. At the state Capitol, the bullet train represents the collision of two things that Republicans — who control Texas government — hold dear: private property rights and an unrestrained free market. And for two legislative sessions in a row, the free market has largely come out on top. The project has emerged relatively unscathed after bills aimed at hamstringing or killing it failed to get much traction. “Big business is a big deal in the state of Texas,” says Kyle Workman, who heads the grassroots opposition group Texans Against High-Speed Rail, an organization that has galvanized rural Texans to lobby local and state leaders to stop the project. Workman says they’ll keep trying when lawmakers reconvene in January. The political debate is an outgrowth of a larger question confronting a state where most people now live in urban areas: How much should rural residents have to sacrifice to solve problems born in the cities they intentionally avoided or outright fled? We’re all familiar with the outline of the debate, so read the story for some more details and personal experiences. I do have sympathy for the folks in the rural counties who are in the path of the rail line, but if we were talking about building a new highway, or expanding I-45, no one would blink an eye. I mean, look at how much got bulldozed and paved over during the Katy Freeway widening. There’s a great unmet need for transportation capacity in this state, and given a choice between building high speed rail lines and building more interstate highway lanes, I’ll pick the former 100% of the time. I wish there were a way to do this without taking someone’s property, but until we perfect Star Trek transporter technology, there won’t be. I don’t know what else there is to say. Here’d where the Texas Central rail route will be, modulo some possible final tweaks and any further political obstacles. Federal officials narrowed the possible paths for a Dallas-Houston bullet train down to one likely route Friday, providing an unknown number of rural Texans the most definitive answer so far as to whether their land will be in the path of the controversial project. Much of the planned route had already been largely solidified. But documents released Friday by the Federal Railroad Administration filled in the rest of the gaps, favoring a more westerly route that runs through Navarro, Freestone, Leon, Madison and Limestone counties. Another potential route that was dropped from consideration would have avoided Limestone County. The release of the draft Friday marked a major step toward getting federal clearance for the project. While it provides a clearer picture of the expected route, the path could slightly change in some areas as development and federal oversight continues. The study also provided new details about stations planned in Grimes County and Houston. The Grimes County station is planned for State Highway 30 between Huntsville and College Station. There are three potential Houston station locations: land where Northwest Mall currently sits, an industrial area across from that shopping center and an industrial area closer to the nearby Northwest Transit Center. The planned Dallas station remains just south of downtown. The report is here. The original report, which listed six possible routes, came out two years ago – the environmental review process is not intended to be quick, but to be thorough. The station in Grimes County is intended to serve the Bryan/College Station area; the Texas Central summary of the report notes that “direct shuttle service to Texas A&M University” will be included, so you Aggie fans might make note of that. What I notice is that the route avoids Montgomery County, where a lot of the opposition to the line was based. Maybe some of those folks will lose interest now that they’re not in consideration any more. Grimes County, where the midpoint station will be located, is also a hotbed of resistance to TCR; Ben Leman, chair of Texans Against High-Speed Rail, just stepped down as Grimes County Judge to run for the Lege. If all goes well for TCR, they’ll have construction going before the next Lege gavels in. Anyway. This is a big step forward for Texas Central. There’s still a 60-day public feedback period, and then the final route will be determined. Both DART and Metro will need to make some decisions about how they will connect to the terminals, and the Houston end has to be chosen. But we’re getting close. With a bit of luck, by this time next year we’ll have had a groundbreaking. I’m looking forward to it. The DMN has more. It looked bad for awhile there. but in the end no significant bill that would have obstructed the high speed rail line was passed. In the recent Legislature, over 20 bills were filed that took aim at a high-speed rail project between Dallas and Houston, including some that may have killed the plan. Ultimately, just two bills passed — one ensuring the state won’t pick up any costs for the train and the other requiring adequate safety measures. Texas Central Partners, the group developing the rail line, didn’t object to the bills. [Texas Central has] always pledged to not seek state or federal grants, a key selling point. That’s one reason conservative groups have praised the project and warned against government overreach. The state has an opportunity to innovate and lead the nation, wrote a chief strategist for the American Legislative Exchange Council. “To realize a boon to taxpayers, Texas merely has to allow the free market to operate by not expanding government in the form of discriminatory legislation,” Bartlett Cleland wrote in an April report. There’s still a long way to go before we can travel from Dallas to Houston in a 90-minute train ride. Federal regulators are working on a draft environmental impact study, expected to be finished this year. More public meetings and revisions will follow, and when construction of the 240-mile line begins, that’s expected to take about five years. That would make the train operational by around 2023. Long beforehand, Texas Central has to raise billions, and Austin represents a potential roadblock. “We talk to investors all the time, and one of their questions is, ‘What’s going to happen in the Legislature?’” said Holly Reed, managing director of external affairs for Texas Central. That question has been answered, she said. But only for now. Some landowners along the potential routes have opposed the project all along, insisting that a bullet train would disrupt their rural way of life and bring few benefits. They’re well organized and have clout with their elected representatives. See here for the last update I had during the session. I suppose the death of the anti-high speed rail bills wasn’t newsy enough to draw attention, or maybe I just missed it. In any event, nothing bad happened for TCR, so barring a late addition to the special session agenda, they can move forward for now. The draft environmental impact study will be a big deal, as will the ongoing eminent domain litigation. With a bit of luck, Texas Central will be far enough along in construction in the spring of 2019 that there will be fewer opportunities to cut them off at the knees legislatively. That part is up to them. Five bills filed by state lawmakers fearful a high-speed rail project planned between Houston and Dallas will be a dud and need help from the state passed a key committee Wednesday, breezing their way past opposition from supporters of the line. The bills approved Wednesday by the Senate Transportation Committee, three by state Sen. Charles Schwertner, R-Georgetown, and one each by state Sens. Lois Kolkhorst, R-Brenham, and Brian Birdwell, R-Granbury, address various concerns. Supporters of the lines called them poison pills not just for Texas Central, but innovation in Texas. See here for the background. The Trib has specifics. The five bills are among more than 20 pieces of legislation aimed at privately-operated high-speed rail in Texas that lawmakers have filed this session. All five also have House companions that have yet to be heard in that chamber’s committees. Senate Bill 979 originally would have prevented any privately operated high-speed rail company from using eminent domain. But state Sen. Charles Schwertner, R-Georgetown, removed that provision in a version of the bill presented Wednesday morning. The bill still requires a company that takes land under the “threat” of eminent domain for a high-speed rail project must return the land to the previous owners if the project isn’t eventually built. The bill passed out of the committee unanimously. Schwertner authored two of the other bills passed Wednesday. Senate Bill 977would forbid lawmakers from allocating any state funds to a privately operated high-speed rail project. It would also prohibit any state agencies from using state money on the planning, construction or operation of a bullet train line. Schwertner’s wording on that provision of the bill is similar to a provision in the Senate’s proposed budget that he wrote. Texas Central called that budget wording a “job killer” that would create “vague and ambiguous questions” about its ability to coordinate and work with the Texas Department of Transportation, which is helping shepherd the project through the federal approval process. But Schwertner on Wednesday presented a memo from TxDOT government affairs director Jerry Haddican. The letter said the state agency should still be able to answer questions from Texas Central, review and provide advice on the company’s plans and build state roads and highways that connect to development around high-speed rail stations under Schwertner’s budget rider. Texas Central president Tim Keith said Wednesday that the memo “was received well” after he “quickly” reviewed a copy of it but the company did not formally change its position on Schwertner’s bill. State Sen. Sylvia Garcia, D-Houston, cast the sole dissenting vote against that bill. Kolkhorst’s Senate Bill 981 would require Texas Central’s line to allow for more than one type of train technology. Texas Central currently only plans to allow for one type of train on its tracks. It is partnering with Central Japan Railway, the company the developed the technology for the Shinkansen bullet trains that run throughout Japan, for the Texas line. Kolkhorst said her bill is aimed at preventing a monopoly, especially if the line is expanded to other cities inside or outside of Texas. “This allows a more comprehensive network to be developed and allows train operators to purchase trains from a variety of manufacturers,” Kolkhorst said. Keith said the line will physically fit other types of trains. But its signaling and safety systems will only be built to accommodate the bullet trains. Garcia again cast the sole dissenting vote against Kolkhorst’s bill. The transportation committee also unanimously passed out Senate Bill 975, which would require high-speed rail operators to reimburse law enforcement agencies for any officers’ time used. The committee also passed Senate Bill 980, which would prohibit any privately operated high-speed rail line from receiving state money or loans unless the state first puts a lien on the project or receives a security interest in it. Garcia also cast the sole dissenting vote on that bill. The bills sound less onerous than when they were first introduced, but Texas Central still opposed them all and said when they were introduced that they considered them all a serious threat to their business. What I would be concerned about right now if I were Texas Central is that Sen. Garcia was the only No vote on any of these bills, even though the Senate Transportation Committee has three Democrats plus Metroplex-area Sen. Kelly Hancock. That’s the first concrete sign that the mostly rural antis have broadened their base of support. If you didn’t know anything about Texas Central, some of these bills would sound pretty reasonable, which may be why they all passed out of committee so easily. But I think it’s fair to say that whatever goals Texas Central had in lobbying against these bills, they didn’t do as well as they surely might have liked. From here on out, it’s crunch time for them. This is a little complicated. A major decision standing in the way of a proposed high-speed rail project connecting Houston to Dallas has been scheduled for trial. District Judge Joseph “Tad” Halbach denied Texas Central Railroad summary judgment in a land survey case in Harris County Dec. 16, sending the case to full trial scheduled for July 3, 2017. Texas Central is in the process of surveying land to determine the best route for the proposed rail. As a result of Halbach’s ruling, the company will not be able to survey on the defendant’s property until after the trial. Texas Central officials said, although they were disappointed in the court’s decision to send the case to a full trial, they believe their arguments will be successful in the end. Texans Against High-Speed Rail—a group opposing the project—is contesting the idea that Texas Central is an official railroad company under state law and therefore does not have eminent domain authority; in other words, Texas Central does not have the authority to force private landowners to sell their land. TAHSR released a statement celebrating Halbach’s decision. See here for some background. The point is that the denial of summary judgment is not in any way a ruling on the merits of the case, it’s just saying there has to actually be a trial to sort that out. Of course Texas Central would have liked to prevail on summary judgment – every plaintiff wants to win without having to go through the full process. They didn’t get that, so a trial it will be. Note that while Judge Halbach made the summary judgment ruling, he will not be the judge at trial, as he was among the judges swept out in November. Shouldn’t make any difference, I just wanted to note that in case anyone gets confused when they see another judge’s name associated with this next year. The Star-Telegram, BisNow, the Chron, and the Press have more. Lawyers for a proposed high-speed rail line between Houston and Dallas withdrew their request for entry to a local landowner’s property, after opponents and the landowner opposed it in front of a Harris County judge, according to opponents of the project. “It is a great day for the vindication of landowner rights,” lawyer Blake Beckham of Dallas said. In a statement, Texas Central confirmed the hearing, but was less decisive about its significance. Beckham represented Calvin House, owner of 440 acres in northwestern Harris County. Texas Central, planners of the high-speed rail line, want access to House’s property as they determine the best route for the train line. In its filings, the company cited its power of eminent domain as a railroad. Opponents, however, argued the company is not a railroad because it is neither operating a rail system, nor does it own any tracks or trains. As part of their filing, Beckham listed the dictionary definitions for “railroad” and “operating” among the exhibit he planned to enter. Texas Central’s lawyers opposed those exhibits in a filing Thursday. Beckham called the hearing significant in a video statement released by Texans Against High-Speed Rail, a group formed to oppose Texas Central’s plans. Perhaps, but I doubt any precedents were set since there was no decision rendered. It’s hard to draw any conclusions from this case since the details about it are so sparse, but even if I did know more I’d still rank it no higher than third on the list of existential threats that Texas Central faces, well behind the forthcoming AG opinion on whether it is a “railroad” for the purposes of using eminent domain, and whatever mischief the Legislature will cook up in the next session. On that score, Rep. Ron Simmons (R, Carrolton), who serves as the Chair of the Transportation Subcommittee on Long-term Infrastructure Planning, predicts TCR will survive. I don’t know that I would take that bet, but Rep. Simmons (whose district is in the Dallas suburbs) is in a better position than I to judge. In a rebuke of a private firm’s plans to build a bullet train between Houston and Dallas, local officials in rural southeastern Texas moved Tuesday to restrict high-speed rail development in their corner of the state. Grimes County commissioners voted unanimously to require high-speed rail developers to acquire a permit and provide sufficient proof of eminent domain authority before building a rail line over county roads, according to Ben Leman, the Grimes County judge. “Texas statutes, as interpreted by courts and not county governments, have long granted eminent domain authority to railroads such as Texas Central, pipeline companies, electric power companies and other industries that provide the infrastructure necessary to serve the public efficiently and enjoy a healthy economy,” the company said in a statement. On the one hand, I understand why rural counties like Grimes hate this project. The trains will just pass through, they’re not getting any benefit from it, and they have no reason to trust any assurances that Texas Central will use eminent domain as little as possible. On the other hand, I want to scream “Will we ever be able to do anything other than build roads in this state?” in frustration. I see this project as being beneficial and necessary for the state, and it will only get more expensive to build the longer we wait. I know, it’s easy for me to say when someone else is being asked to take one for the team, but what do you want from my life? Anyway. Either Texas Central will survive the various challenges to its ability to use eminent domain or it won’t. In either outcome, Grimes County’s actions here likely won’t matter. It’s just another step in the process. UPDATE: Here’s a statement from TCR in response to this action, which disputes my claim that Grimes County will not see benefit from the project; they have also published this one-page overview of what Grimes County will get out of the railroad. Finally, here’s their statement on eminent domain. It’s sure to draw a lot of proposed legislation, now that the Surface Transportation Board (STB) has declined to get involved at this time. “We were glad the STB ruled as quickly as they did because that allows us to set the path forward and if they had any uncertainty it could have impacted the project’s timeline,” said Holly Reed, Texas Central’s managing director of external affairs. The company expects construction to start in 2017 and rides to start as soon as 2021. With the Surface Transportation Board’s decision, the extent of the role of the federal government in the Texas project is unclear. The Federal Railroad Administration is still in the midst of an environmental impact study of the project. “STB oversight has things that are positive and negative for the project based on either direction that it would decide, so getting a timely decision was important,” Reed said. Even though Reed did not express displeasure with the Transportation Board’s decision, opponents of the project are celebrating it as a victory. Many lawmakers who opposed the project last session are pointing to the Transportation Board’s ruling as a reason to feel emboldened about stopping the project dead in its tracks in 2017, even as Texas Central gears up to begin construction. “Fortunately for landowners and all who value property rights, the Surface Transportation Board made the right decision and declined oversight,” Metcalf said in a statement. State Sen. Robert Nichols, a Jacksonville Republican who chairs the Senate Transportation Committee, said when the decision was released, “there was joy and celebration in the heartland of Texas,” where he said people don’t want the train. The ruling appears to put the project in limbo, he said. Peter LeCody, the president of Texas Rail Advocates, said he expects to see efforts to pass more wide-reaching legislation when the Legislature reconvenes in January. See here for the background. As I said before, while the opponents of Texas Central have (in my estimation) more legislators on their side than its advocates do, they don’t have a majority. The key to this session will be which side can convince enough of the many legislators who have no direct interest in the issue to join them. The lobbyists are going to be busy, that’s for sure. A proposed high-speed rail line between Houston and Dallas will remain a mostly Texas matter following a federal decision which opponents cheered as a blow to the project, while backers said provided a definitive scope of the planning process. The Surface Transportation Board on Monday determined it has no oversight of the 240-mile line planned by Texas Central Partners that has drawn opposition from rural residents while enjoying support in the two metropolitan areas because the project lies completely within Texas. Texas Central had argued its connectivity to Amtrak gave federal officials some oversight, but the board rejected that. “Should Texas Central develop concrete plans that would make the Line part of the interstate rail network, such as an actual through ticketing arrangement with Amtrak or a shared station with an interstate passenger rail line, Texas Central could seek board authority at that time,” federal officials wrote in their decision. Texans Against High-Speed Rail, formed to oppose the line’s development through rural areas, called the federal decision a major victory, along with a number of local elected leaders. See here, here, and here for the background. A copy of the STB’s letter is embedded in the Chron story. I’m not sure how much difference this makes, because whatever the STB had decided to do, there will be a renewed effort among Texas Central’s opponents to put insurmountable obstacles in their way in the next legislative session. There’s a group of legislators – mostly rural, with some suburban, all east of I-35 – who oppose the proposed high speed rail line, and there’s a group of legislators – mostly urban, with some suburban, all in the Houston and Metroplex area – who support it. The former group is larger and more driven, but they are not close to a majority. The question is what happens if they manage to get a bill that would cripple the rail line out of committee. We don’t know how open the large number of uncommitted legislators are to either side’s arguments, and we also don’t know what Greg Abbott’s opinion is. If Texas Central can make it through the 2017 session without getting kneecapped, they will be able to start construction as they hope to later that year. I believe that once they do start building the line, it will become a lot harder to kill, though that won’t stop anyone from trying. This will be a big issue to watch in the spring. The Press has more. Nothing like a little eminent domain action to spur some people on. In the four years Texas Central Railway unveiled plans to link Dallas and Houston with the country’s first bullet train, officials with the private company have talked a lot about how quickly the line will whisk travelers between two of the country’s largest, fastest-growing urban areas, about how darn Texan the early investors are, about the stellar safety record of the Japanese rail technology they’ll be using. By contrast, the company has talked very little about its planned use of eminent domain, which is the legal term for when a government, or frequently a private company that has the government’s endorsement, takes someone’s land. When the topic has come up, the company has typically responded by stressing its strong preference for negotiating with landowners to find a mutually agreeable price for their land. The problem with that response is that it fails to acknowledge some fundamental truths about human beings in general and landowners in the rural areas along the bullet train’s proposed route in particular. People, as a rule, don’t like having their property sliced in two by large infrastructure projects. People in places like Ellis and Grimes counties really, really don’t like having their property sliced in two by a private, Japanese-backed venture whose only benefit for them will be the privilege of marveling at the wondrous bullet-train technology as it zooms by atop a 14-foot berm. If the line is ever going to get built, Texas Central will have to use eminent domain against hundreds, maybe thousands, of landowners. Texas Central now admits as much. In filings last month with the federal Surface Transportation Board, which regulates the operations of the freight and passenger rail market, the company indicated that it’s ready to start acquiring right-of-way for its track. In the weeks since the filling, the Surface Transportation Board has become the site of a pitched battle between Texas Central and its opponents, with powerful surrogates on both sides. Several members of Texas’ congressional delegation, and about a dozen state legislators, have waded into the debate. Congressmen Joe Barton of Ennis and Kevin Bradyof suburban Houston have filed letters opposing Texas Central while Dallas’Eddie Bernice Johnson and Corpus Christi’s Blake Farenthold offering statements of support. The stakes are high. Texas Central says it needs Surface Transportation Board approval in order to begin using eminent domain under Texas law, an obvious prerequisite for actually building and operating a railroad.That means the Surface Transportation Board represents a regulatory choke point, a rare point where opponents can conceivably derail the project in one fell swoop. See here for some background. If you look at Rep. Johnson’s letter, you will see that it was also signed by Rep. Gene Green of Houston. No surprise, since urban Democrats have been big supporters of the rail line so far. The surprise was Rep. Farenthold, as his district isn’t in the path of the train and is more rural than urban. Gotta give him credit for that – he didn’t have to get involved, and having at least one Republican in their corner will help TCR make its case. I don’t know what the timeine is for the Surface Transportation Board, but I agree that this is a potential choke point, and it could have a disproportionate effect on the ultimate outcome. I’ll keep an eye on that. In a filing with the Surface Transportation Board, North Texas Congressman Joe Barton (R) Arlington has come out against a high speed rail project between Dallas and Houston. Barton, whose district encompasses parts of Tarrant County and the city of Arlington that supports Texas Central Railway’s high speed rail line, claims that Ellis and Navarro counties in his district will be dissected. Barton, who in the filing dated May 9, 2016 said that while he generally supports private investment in high speed rail projects, voiced that the project would not be economically feasible or necessary. He claims that inexpensive air travel is available between Dallas and Houston and there are few delays on I-45 between the two major regions. In his letter to the STB Congressman Barton said that county and state roads would be closed off if the rail line is built and that few jobs would be created in construction of the 240 mile rail line. You can see Barton’s letter here. Barton is not the first member of Congress to come out against the high speed rail line; Rep. Kevin Brady was already there. And if you’re wondering what the Surface Transportation Board is, there you go. Barton’s letter came a couple of days after TCR formally asked the STB to get involved. Developers of Texas’ high-speed train have asked the federal Surface Transportation Board (STB) to confirm it has oversight of the project, bringing it in line with the nation’s other major passenger and freight railroads. Texas Central recently filed a formal petition to the STB, asking that the agency affirm its jurisdiction over the project and to weigh in on critical next steps that will include construction and operation of the passenger link between North Texas and Houston, with a midway stop in the Brazos Valley. Texas Central is required to seek STB certification of the project, thus complying with the federal regulatory process that all newly constructed rail lines must follow. Links here and here to the two STB filings. This request does not seek to remove protections afforded to landowners under Texas law. It merely clarifies the STB procedures that Texas Central must follow and does not change or override any state landowner protections. The STB will not issue a final decision until the environmental review is completed but Texas Central asked the board to issue an interim order as soon as practicable. 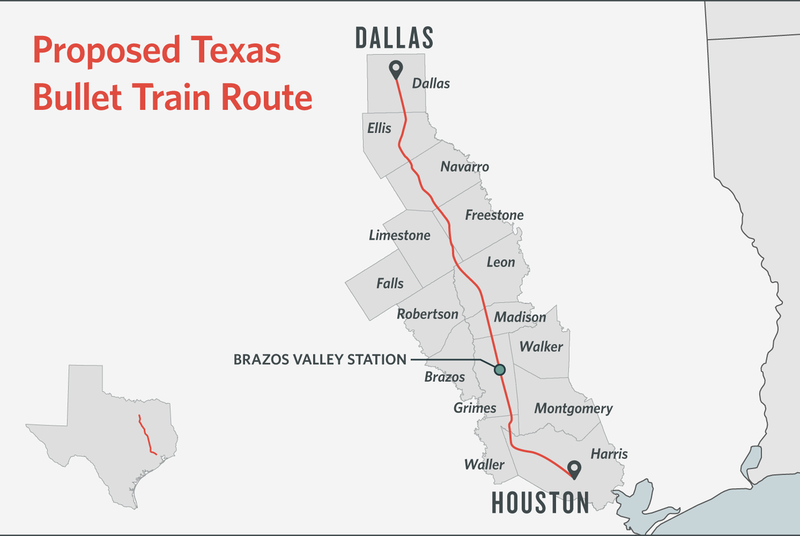 * The Texas route – between two major commercial hubs – fills a gap in existing passenger service and significantly adds to the country’s general passenger railway network. * Its planned passenger stations – in Dallas, Houston and Grimes County – are designed to enhance local and interstate transportation connections. A draft environmental impact statement from the FRA, which began work on that last year, is expected this summer. There will be more hearings on the proposed routes after that, with construction aimed to begin in late 2017, although Texas Central has suggested the timeline may slip into 2018. Assuming this happens at all, which if the opponents keep piling up powerful allies may be in doubt. I’m still mostly optimistic, but there sure are a lot of obstacles out there, and in the end it may only take one. They seek information that they say they have been denied so far. A group opposed to a private firm’s plans to build a bullet train stretching from Dallas to Houston has filed a lawsuit against the Texas Department of Transportation and Texas Attorney General Ken Paxton in an effort to obtain communications between the firm and state officials. Texans Against High-Speed Rail submitted a public information request last year to TxDOT seeking any documentation from the agency related to Texas Central Partners, the private firm developing the rail. The group is arguing that many of the documents responsive to the request were withheld and the information that was released was heavily redacted without clear reasoning. Workman said the request, submitted on March 20 last year, asked for any documents concerning Texas Central or its proposed high-speed railway from 2009 to 2015. The lawsuit claims the resulting records would likely consist of email communications between the various entities involved with the project. The Attorney General ruled in July that TxDOT could withhold documents discussing certain information. Workman said the group eventually received some documents from their request earlier this year, though they had significant holes. The Attorney General’s office did not return requests for comment Thursday. The theory that Texans Against High-Speed Rail is working on is that the state is secretly in cahoots with Texas Central, rather than simply serving as a regulator. Anything’s possible, I suppose, though I don’t really see Ken Paxton as being particularly sympathetic to Texas Central. But we’ll see. Thirty-three East Texas officials sent a letter to the Japanese ambassador to the United States on Monday to express their opposition to a private Texas firm’s proposed high-speed rail line between Dallas and Houston that has strong ties to a Japanese company. The letter is the latest effort by opponents of Texas Central Partners’ multibillion-dollar project since the firm’s 2012 announcement of its plan to bring Japanese train operator JR Central’s bullet train technology to Texas. Under the agreement, JR Central would sell its Shinkansen trains to Texas Central and play an advisory role on the system’s operations. A Japanese-backed government fund has also invested $40 million in the project. In the letter to Japanese Ambassador Kenichiro Sasae, local officials argued that the bullet train would burden their communities without providing any benefits and called on Sasae to seek out a different market for the project. The signers of the letter include eleven Republican members of the Legislature: State Sens. Brian Birdwell of Granbury, Lois Kolkhorst of Brenham and Charles Schwertner of Georgetown, and State Reps. Trent Ashby of Lufkin, Cecil Bell of Magnolia, Byron Cook of Corsicana, Kyle Kacal of College Station, Will Metcalf of Conroe, John Raney of College Station, Leighton Schubert of Caldwell, and John Wray of Waxahachie. Other signers include several county judges, county commissioners and members of sub-regional planning commissions in the rural areas that would be most affected by the proposal. “While we respect your country’s ambitious goal of exporting the Shinkansen technology, as residents and leaders in East Texas, we remain opposed to the HSR Project because it will cause irreparable harm to our communities,” the officials wrote. Texans Against High Speed Rail, which spearheaded the letter, touted it as a reflection of “overwhelming local opposition” to the project. Given that the partnership between Texas Central and JR Central is a private one that does not directly involve the ambassador, Texans Against High Speed Rail is primarily hoping that Sasae will help facilitate further discussion with all interested parties, according to Judge Ben Leman of Grimes County, one of the signers of the letter. Okay then. I guess it’s unclear to me what the letter writers hope to accomplish with this. Do they think the ambassador will pick up the phone and call Texas Central and tell them “Hey, you guys may not be aware of this, but some folks don’t like your project”? Or maybe pick up the phone and have the same conversation with some of the actual or potential Japanese investors in Texas Central? Has any business venture in another country that was backed by US-based companies been affected by the penning of a letter to the US ambassador in said country? I really have no idea what, other than getting a story written in the Trib (for which I say, well done), this was supposed to do that a letter to the editor of one’s local newspaper wouldn’t have done. I suppose one must do something during the legislative off-season to keep the momentum. The Press has more. It could be a lot, if one study is to be believed. An analysis of a planned high-speed line between Houston and Dallas shows the $10 billion-plus project will have an economic impact roughly three times its expected price tag, though critics contend that estimate ignores many costs rural residents will pay, if the line is ever built. The economic impact report, commissioned by the firm planning a high-speed train between Houston and Dallas, estimates the 240-mile line would have a $36.3 billion impact on Texas over the next 25 years. The analysis, by Allen-based Insight Research Corp., was commissioned by Texas Central Partners, which summarized its findings on Thursday. Texas Central CEO Tim Keith said the economic analysis – one of many the company is preparing as part of its federal review and the process of selling communities on the line – supports the benefits the company has claimed. “The overall message here is we are on a path to keep our development pace moving quickly,” Keith said. The company plans to begin construction in 2017, and start ferrying passengers in 2021. Officials on Thursday also confirmed they plan a stop between the two sprawling metro areas aimed at potential Bryan-College Station riders. That station would be located in Grimes County, one of the counties where the bullet train has faced the stiffest opposition. “One of the questions that’s been asked is ‘what does this do for me?” Keith said, noting the push back the project has received. Grimes County, for example, would receive an estimated $50 million – five times the county’s fiscal 2016 property tax collections – while the local school district would receive more. Across Texas, the project would create about $3.1 billion in tax revenue between now and 2040, including $2.5 billion directly from construction of the line. What’s unclear is whether those communities consider any economic gain something to celebrate. Workman said the economic impact included many details officials already have hinted at. He called some of the pronouncements speculative until the public had a chance to examine the complete economic analysis. “Their whole economic analysis is based on a successful project,” he said, noting success is not assured with airline travel popular between the metro areas and people likely preferring to drive. Well, sure, I mean, who studies the potential impact of a failed project? It’s called “potential impact” precisely because you’re assuming it will be successful, not because you know it will be. You can find the study and the associated press release from Texas Central here. Of interest to me is that there will be a station added in Grimes County, home of some fierce opposition as well as proximity to Bryan/College Station. Will that dampen any of the opposition? Will the addition of an in-between station change anything about the viability of the route? In an alternate universe, we could be talking about a station in The Woodlands, which might have been more appealing to Texas Central and its potential riders. I look forward to seeing what comes next. The Trib, the Highwayman, and Dallas Transportation have more. The private firm hoping to build a high-speed rail line between Dallas and Houston has been celebrating a summer of successes: completing a successful round of fundraising, seeing a key federal study move forward, surviving the legislative session unscathed. But three years after Texas Central Partners first revealed its ambitious venture, a series of financial, logistical and political challenges remain. To Kyle Workman, president of Texans Against High-Speed Rail, those challenges are enough to make him question whether construction on the project will ever begin. Yet Tim Keith, who has served as Texas Central’s CEO for just more than a month, said the project is moving forward as planned and is more or less on schedule. While many Houston- and Dallas-area officials have backed the project, officials in communities in between have mostly come out against it. Statewide officials have largely avoided taking a position. “I want to see transportation needs satisfied,” Texas Gov. Greg Abbott said when asked about the bullet train at a June press conference in Dallas. Though he didn’t make clear whether he supports the bullet train, Abbott touched on the two issues that drew concerns from the Legislature this year. He said he aimed to ensure that the project neither spent any public tax dollars nor infringed on private property rights. “As this process moves along, I will diligently work to ensure that both of those criteria are satisfied,” Abbott said. Yes, for all the jockeying that various legislators and local officials have done, the statewides have been pretty quiet about Texas Central. Normally, a business that plans to invest billions in Texas would be catnip for Abbott and Dan Patrick and so on, but the politics here are more complex than that. My guess is that they will jump on the bandwagon of whichever side prevails, right around the point at which it becomes clear which side will win. The Federal Railroad Administration launched an environmental review of the project in 2014. Last month, the railroad administration narrowed its focus for the train route to a “utility corridor,” which is reserved for high-voltage electric transmission lines. Any route within that corridor would likely involve the train crossing some private land. Keith, who joined Texas Central as CEO in July, said he is hopeful the railroad administration will offer tentative approval for a route within the corridor this fall and that the company would be able to quickly follow with discussions with affected landowners. A railroad administration spokesman declined to comment. Major infrastructure projects hit a turning point when people can study specific routes, said Robert Puentes, director of the Metropolitan Infrastructure Initiative at the Brookings Institution in Washington, D.C.
Company officials are expected to formally request next year that the railroad administration agree to waive or tweak various federal regulations. Keith acknowledged the train’s speed is part of the need for regulatory waivers but said so too is the system’s advanced technology, including its signaling and automatic train control system, both of which would be new to the United States. The Shinkansen’s famed record of zero casualties in over 50 years of operation in Japan is likely to play a central role in the company’s argument to federal regulators. “The approach that this system takes is crash avoidance and that is different from some of the existing regulations for trains currently operating in the U.S.,” Keith said. I feel pretty confident that Texas Central will pass the environmental review process. I doubt knowing the specifics will cool the ardor of their opponents, so they need to do what they can to avoid making any more enemies, because at some point that just becomes untenable. Looks like we may know something by mid 2016 or so. Paradise in Hell has more. One more step in the process. The Federal Railroad Administration announced this month that the general route preferred by the project developer of a high-speed rail line between Dallas and Houston is indeed the best choice. Known as the “utility corridor,” it runs somewhat along high-voltage electrical transmission lines and capitalizes on relatively straight, existing easements. “It’s of interest to us because it provides a source of power for our system, is straighter for a larger portion and therefore more suitable for the engineering,” said Tim Keith, chief executive of Texas Central Partners, the developer. The utility easement runs only to about Palmer in Ellis County. Between Dallas’ Union Station and the Trinity River, the path follows a railroad corridor. The federal report issued Aug. 10 does not outline a specific route but a broad path with many possible alignments. Corridor choices were wide swaths. Elements of each could still make it into the final plan. “There’s not a whole lot of clarity even with the declaration of the corridor,” said Kyle Workman, president of Texans Against High Speed Rail. But Texas Central Partners says it’s enough of a definition to host open houses in towns along the line. “As we identify that final alignment, we will know which parcels are effective and which landowners we will engage with,” Keith said. Basically, what happened is that Texas Central agreed to fund the environmental impact study, but the FRA is the one actually conducting said study. The FRA had simply reviewed the four proposed corridors for the bullet train. Texas Central had concluded that three of the four corridors were not viable options for various reasons, but the fourth corridor, which will run along or nearby high-tension utility lines, met the company’s criteria. So yeah, two weeks ago the FRA posted a report stating that it had checked Texas Central’s information and reported that it was accurate and that Texas Central’s preferred line was the one option of four submitted that fit various criteria. But that doesn’t exactly mean the FRA approved anything. Now the FRA will simply continue with its environmental impact study of Texas Central’s proposed route. Agency reviewers are set to look at alignments, meaning they’ll consider the specific route instead of a broad swath of land — such as scouting specific locations and property near nearby the proposed line, along with tackling right-of-way issues. When you get to the alignments stage you have to know exactly where things will be in a fairly precise way, according to the FRA staffer. Texas Central is responsible for doing the proposals and approaching landowners and the FRA is responsible for reviewing these options and figuring out the best options and alternatives. Once the alignment study is done, the FRA will finish up its environmental impact study – there’s months of work to do so it won’t be completed until next year at the earliest. Then there will be meetings and feedback and the FRA will issue it’s findings. So, to sum it all up: The FRA didn’t so much approve the utility route as a corridor as it agreed that based on Texas Central’s work, and information reviewed by the FRA, that they would take Texas Central’s word that the utility corridor was the most viable option. Also, this happened two weeks ago. Also, Texas Central reps don’t seem to know when it actually happened. Got all that? The utility corridor is preferred because the freight rail corridor has too many curves to accommodate the speed of the bullet train, and because there were issues in sharing tracks. Some of that will still need to be done under this alignment, as the utility corridor doesn’t run all the way to Dallas, but this will minimize that. Either way, the Houston end of the corridor is currently northwest of downtown, near 610 and 290. Whether the train continues into downtown or the terminal is built there – assuming all of the political opposition is overcome, of course – remains an open question, one that I hope the Mayoral candidates have given at least a passing thought to. Be that as it may, the next step in the process is the draft environmental impact statement. According to the Chron story, that’s about halfway done, though as noted above it’s still months away. That’s the point at which things start to get real. They’ll need more than this, but it’s a start. Texas Central Partners, which aims to build a bullet train between Texas’ two biggest cities, announced Wednesday they had raised $75 million in private investments in the company’s first round of fundraising. That funds are intended to allow the ambitious $10 billion project to move forward from feasibility studies to development planning. The company also hired a new CEO: Tim Keith, former CEO of RREEF/Deutsche Bank Infrastructure Investments. The funds will help move to the second phase: development planning. Keith said the $75 million will be used to wrap up the environmental study, work with federal authorities to settle on rules for high-speed rail in Texas, grow the company with key hires, expand its consulting base and sponsor more ridership studies. The $75 million raised is more than the company sought for the first round of investments. While it allows the project to move forward, the funds are small change compared to the final $10 billion price tag. Keith says the rest will come through big private investment from private equity funds, large pension funds and large real estate and asset investors. “It’s a big project, it’s a big idea, it has a big cost to build, but it will deliver lots of benefits to the state,” Keith said. Glad to hear it. There’s still a long way to go and a lot of obstacles to clear, however. Keith and his company have plenty of obstacles to overcome before the project becomes a reality. State and federal authorities are still evaluating the line. And organized opposition from rural Texans who farm and live in the large expanse between Dallas and Houston that nearly derailed the project during this year’s legislative session has not died down. Many landowners oppose the fact that Texas Central is allowed to use eminent domain for the project. Company officials say they plan to work with residents and will only use eminent domain as a last resort, when a land deal simply can’t be reached. But Kyle Workman, president of Texans Against High Speed Rail, said that eminent domain will have to be used in most cases. “Because nobody wants to sell their land,” he said. Remember, the opponents are still organizing even with the Lege not in session. TCR is going to need to make all the gains it can before 2017, to make it that much harder to put up obstacles for them. We’ll see how far this takes them. The budget rider to derail the high speed train is still under contention as the conference committee completes its work. The budget rider is one of several efforts by some Republican lawmakers to stop Texas Central Railway’s plan to build a high-speed rail line that would travel between Dallas and Houston in less than 90 minutes, reaching speeds of 205 mph. Texas Central has vowed to not take public operating subsidies. Nonetheless, company officials say the rider would kill the train because TxDOT, as the state agency in charge of transportation, would need to play a role in the project’s construction. “If enacted the rider would constrain TxDOT’s ability to work with Texas Central Partners to perform important public safety duties,” the company argues on a website it launched this week to rally public support against the rider. The Senate’s lead budget negotiator, Finance Chairwoman Jane Nelson, R-Flower Mound, said the rider remains one of the final sticking points between the House and the Senate. Two vocal critics of the project, Republican Sens. Lois Kolkhorst of Brenham and Charles Schwertner of Georgetown, are among the five senators on the budget conference committee working out a compromise version of the budget. Schwertner said he was fighting for the rider to remain in the budget, citing concerns about how the project will impact property values and local economies. “There’s all sorts of potential problems with the project that must be heard,” Schwertner said. Nelson said there have been multiple discussions about how to amend the rider in an effort to find a compromise. See here for the background. I personally am not a fan of settling policy matters in this fashion. It’s terribly un-democratic, as the finalized budget, with or without Rider 48, is not subject to debate or further amendment, just an up or down vote on the whole thing. The folks who oppose Texas Central Railway, who make their case for keeping Rider 48 on the Texans Against High Speed Rail Facebook page, were able to get bills introduced in each chamber to impede if not completely obstruct TCR, with one of those bills getting out of committee. Neither got any farther than that, but that’s the way it goes for 90% or so of all bills. It seems likely they’ll have another crack at it in 2017, and there’s always the possibility of federal action, too. There’s nothing nefarious about what they’re doing – budget riders are a well-known part of the puzzle – I would just prefer not to see the matter settled in this fashion. Never forget that the tricksiest maneuvers in the legislative handbook come in the budget. Texas’ prospects of having the first high-speed train line in the nation hinge on two sentences in a proposed state budget that lawmakers in the House and Senate must hash out before the end of the month. The Senate’s budget would prohibit the Texas Department of Transportation from spending any resources overseeing or regulating a privately funded attempt to connect Dallas and Houston with a bullet train. Company officials say that will effectively kill the project because Texas Central Railway needs the state Transportation Department’s knowledge and oversight for key aspects of the project, even though it’s not seeking state funds for construction. It was unclear Tuesday which senator on the conference committee hashing out both chambers’ budgets added the lines affecting high-speed rail projects. State, local and Texas Central officials described the addition as a backdoor attempt to mandate policy outside of public view. “This was something that came in the dark of night and we just haven’t had a public discussion on it yet,” said Dallas Mayor Mike Rawlings, a major supporter of the project. Texas Central chairman and CEO Richard Lawless said the addition of the language undercuts lawmakers’ consistent portrayal of Texas as a business-friendly state whose officials don’t hamstring private entities. Sen. Jane Nelson, R-Flower Mound, chairs the group of senators who will work with House counterparts to reconcile both chambers’ bills. She could not be reached late Tuesday. That conference committee of lawmakers is focused on major differences on how best to provide tax cuts. It remains unclear whether or how they’ll address the Senate’s proposed language on high-speed rail projects. Freshman Sen. Don Huffines, R-Dallas, isn’t on the conference committee but said he’s been talking to Nelson and other members about striking the language from the bill. “I’m cautiously optimistic,” Huffines said. As are the rail opponents, who as we know have been unable to get a bill passed to do what they want. At least this is now out in the open, so everyone knows what they’d be voting on. If this particular rider makes it through the conference committee process, it’s as good as in. If not, then that’s likely to be all she wrote. I’d say at this point that the odds slightly favor it not being part of the budget, but we won’t know for sure till we see the final product. On a side note, Southwest Airlines reiterated their position that they haven’t taken a position on Texas Central Railway. In fact, according to the Chronicle’s Erin Mulvaney, Southwest Airlines CEO Gary Kelly said Wednesday the Dallas-based airline has not yet taken a stance on the high-speed rail line. Kelly’s statement is similar to others the company has made since the rural opposition became more vocal. Kelly said that during the dust-up in the 90s, the plan to build a rail required government subsidies. Kelly said private developers have the freedom to build whatever they can. “If it’s privately funded venture, I haven’t spent any time thinking about that,” he said. Nothing to add to that, just noting it for the record. Will the high speed rail opponents get a bill passed? Seems unlikely at this point, but I wouldn’t count them out. Starting in 2021, Texas Central hopes to have its high-speed rail up and running, with trains traversing East Texas 62 times a day. The company says its tracks will be no wider than 100 feet at any point, requiring a total of 3,000 acres along its 240-mile route between Dallas and Houston. The company said in a statement that it plans to “design large, frequent and conveniently located underpasses or overpasses to allow for the free movement of farm equipment, livestock, wildlife and vehicle traffic.” The electric-powered trains will be quieter than an 18-wheeler, the company says. Workman is helping lead a coalition of high-speed rail critics backing several bills this session that could kill, or at least hobble, Texas Central’s ambitious project. Their partners include the Texas and Southwestern Cattle Raisers Association and county officials in all nine rural counties along the train’s proposed routes. Two bills in particular have caught opponents’ attention. A bill from state Rep. Will Metcalf, R-Conroe, would require high-speed rail projects to secure approval from elected officials of every city and county along a proposed route. A measure from state Sen. Lois Kolkhorst, R-Brenham, would strip all high-speed rail companies of the eminent domain authority given to other rail firms. Texas Central argues that the bills unfairly target its project just because its train would go faster than most others. The group’s leadership also includes Grimes County Judge Ben Leman and Magnolia funeral home director Glenn Addison, who ran for U.S. Senate in 2012. The group hit a speed bump last month after The Dallas Morning News reported that it had hired an Austin lobbyist who also counted Dallas Area Rapid Transit as a client. DART has publicly backed the bullet train. Following the report, Texans Against High-Speed Rail had to quickly hire new lobbyists. With less than a month left in the session, none of the bills targeting Texas Central’s project have reached the full House or Senate for a vote. This session may be the only shot for activists to stop the project at the Legislature. Construction could begin as early as the fourth quarter of 2016 depending on when the current federal review is completed, according to Texas Central. The Legislature is not scheduled to reconvene until 2017. Workman predicted that if the Legislature doesn’t stop the project this year, growing community opposition will slow the company’s schedule enough that lawmakers will be able to address it in the next session. “We are telling people that this is a three-year fight and we have two sessions that we have to go through,” Workman said. See here for the background. Let’s assume neither the Metcalf bill nor the Kolkhorst bill gets passed in any form. If that happens, then it’s a question of how far along Texas Central can get on the federal EIS process by 2017, and whether they can do anything to blunt the opposition by then. There’s also the possibility of litigation, and given the shenanigans that light rail opponents in Houston trotted out, all sorts of delay and distract potential. So overall I’d say Workman is right that this fight will still be going on in the next session, but there’s a wide range of possible places for each side to be when that next session gavels in. Finally, keep an eye on Southwest Airlines and what if any position they take in this debate. They may or may not get involved, but if they do it could have a significant effect. City Lab takes a look at the people who are resisting the proposed Texas Central Railway. Turns out you don’t need to rely on public money to be hated as a U.S. high-speed rail project. That much is becoming clear from the battering being given to a big Texas bullet train plan that’s privately funded. A quick recap: Texas Central Railway, a private firm, is pushing a very promising proposal to link Dallas and Houston with a Japanese-style high-speed train capable of doing the trip at 200 mph. By relying on investors rather than taxpayers, the plan seemed poised to avoid a lot of the fiscal (slash ideological) squabbles that have plagued its federally-funded counterparts in California, Florida, Ohio, and Wisconsin. But with the project advancing toward route selection and environmental review, an intense opposition has emerged. It’s taken the form of anti-HSR groups (e.g. No Texas Central and Texans Against High Speed Rail), local legislation designed to stop the project, packed and panicked community meetings, and pleas for Congressional representatives to block any applications made by Texas Central to the Surface Transportation Board. So far the high-speed rail pushback seems to be falling into three broad categories. Click over and see how they were categorized. Nothing really new here, but it’s a succinct summary and a good quick reference guide if you need it. Speaking of the legislation that has advanced out of committee, the Trib notes that its author, Sen. Lois Kolkhorst, hasn’t always been anti-rail. Yet as recently as 2012, Kolkhorst was listed as a member of the legislative caucus of the Texas High Speed Rail and Transportation Corporation, a nonprofit that has advocated on behalf of cities and counties to encourage private sector development of high-speed rail in the state. Kolkhorst’s chief of staff, Chris Steinbach, said there was no contradiction in her actions, as she is not uniformly opposed to high-speed rail. Kolkhorst was a state representative from 2001 to 2014, when she won a special election to take a seat in the Senate. The Dallas-based Texas High Speed Rail and Transportation Corporation identified Kolkhorst as a new member of its legislative caucus in 2007. Steinbach said the senator joined the corporation at the request of some of her constituents. She has not been a member of the organization’s legislative caucus as a senator. The Texas High-Speed Rail and Transportation Corporation launched in 2002 with a focus on encouraging private sector development of the Texas T-Bone, a proposed high-speed rail system connecting San Antonio, Austin, Houston and Dallas-Fort Worth, according to David Dean, the corporation’s public policy consultant. The corporation has more recently encouraged private sector high-speed rail development anywhere in the state but is not officially endorsing Texas Central’s project, Dean said. Whatever. Look, people can change their minds, and they can decide that this project is OK but that one is not. As I’ve said before, there are valid reasons for folks in the affected rural reasons to oppose this project. But if this does succeed – and to be clear, I remain in favor of it – then perhaps that also-long-discussed Texas T-Bone would be more likely to finally get built, and it might very well be the kind of boon to the rural communities that TCR will be for Houston and Dallas. A little big-picture thinking would be nice here, that’s all I’m saying. Lawmakers in Austin who represent thousands of Texans along the proposed Dallas Houston high-speed rail project being promoted by Texas Central Railway (TCR) have officially requested opposition to the project from the Texas delegation in Washington, DC. With an application to the federal level Surface Transportation Board (STB) likely, all five state senators and nine state house members who represent the areas between Dallas and Houston called on the federal delegation representing those areas to preemptively oppose any application for public convenience and necessity by the high-speed rail company at the STB. Texas State Senators Brian Birdwell, Brandon Creighton, Lois Kolkhorst, Robert Nichols and Charles Schwertner, as well as State Representatives Trent Ashby, Cecil Bell, Jr., Byron Cook, Kyle Kacal, Mark Keough, Will Metcalf, John Raney, Leighton Schubert and John Wray, signed the April 10 letter siting TCR’s intent to use eminent domain to acquire land, loss of property value, project viability concerns and widespread opposition as their reasons for opposing the proposed bullet train. What that tells me is this: These 14 rural lawmakers who oppose high-speed rail in Texas fear they’ll fall short of blocking the project in the Legislature, so now they’ve opened up a second front. That makes a better show of things for the folks back home. Even if Sen. Lois Kolkhorst gets her rail-killing SB 1601 through the Senate, it would have to survive the choke-points in the House. I agree with his view of the prospects for Sen. Kolkhorst to get her bill passed. The fact that two Republicans on the committee, both from the Metroplex, suggested this would be a tough fight for her, as she couldn’t simply count on partisan advantage. If you follow this link from Jones’ piece, it’s about the invocations by rail opponents of the much-hated Trans Texas Corridor. While there are some parallels between these two projects, there are some major differences as well, with the amount of right-of-way needed – about 100 feet for Texas Central Railway versus nearly 1000 feet for the TTC – being a key one. I have some sympathy for these rural counties, as there’s not much the Texas Central Railway project will do for them, but I don’t care for fearmongering. To address the allegations that high speed rail opponents have been making, TCR released Texas Central Rumor vs Reality, which is included in Jones’ post. I’ve had the experience of riding the shinkansen in Japan, so I can speak directly to the noise issue: That train is actually amazingly quiet. It’s no louder than Houston’s light rail line, and in comparison to, say, truck traffic on a highway, it’s barely noticeable. There’s more in the document, so go check it out. There are arguments to be made against the TCR, and opponents in rural areas have a point when they argue that they are not beneficiaries of this project. But they lose me when they start making stuff up. The Star-Telegram has more. Didn’t know there was one of these. The Senate Transportation Committee voted 5-4 to pass out Senate Bill 1601, from state Sen. Lois Kolkhorst, R-Brenham, which would strip firms developing high-speed rail projects from eminent domain authority. Texas Central High-Speed Railway is developing a privately financed bullet train to carry passengers between Houston and Dallas in less than 90 minutes, with a single stop in between near College Station. The company has said it hopes to have the train running by 2021 and has vowed to not take any public subsidies. While the project has drawn strong support in Houston and Dallas, officials in the largely rural communities along the proposed route have expressed opposition. Kolkhorst said Wednesday that she didn’t want to see private landowners lose their land for a project that she believed is likely to fail. Four Republicans joined Kolkhorst in voting for the bill: Transportation Chairman Robert Nichols of Jacksonville, Troy Fraser of Horseshoe Bay, Kelly Hancock of North Richland Hills and Bob Hall of Edgewood. Voting against the bill were two Houston Democrats, Rodney Ellis and Sylvia Garcia, and two North Texas Republicans, Don Huffines of Dallas and Van Taylor of Plano. Texas Central Chairman and CEO Richard Lawless told the committee he felt his company was being unfairly singled out. Those informational meetings sure look like a necessary idea. I noted a bill filed in the House that would have required each city and county along the route to approve the idea. Maybe that was overkill, as that bill has not been scheduled to be heard in committee as yet. What’s most interesting here is that the vote against it was bipartisan, with two Metroplex-area Senators not joining with their mostly rural colleagues (Kelly Hancock being the exception) on this. That suggests to me that this bill might have a hard time coming to the floor, or even getting a majority. If that’s the case, I’m okay with that. Hair Balls has more. Given all that’s been going on lately, I suppose this was inevitable. A lawmaker whose district sits near the proposed route for a planned bullet train connecting Houston and Dallas filed a bill Wednesday that could stop the project in its tracks. House Bill 1889 from state Rep. Will Metcalf, R-Conroe, a persistent critic of the plan, would require the elected officials of every city and county along the route to approve the project. That seems improbable, given the opposition in some rural areas. While officials in Houston and Dallas have championed the project, officials and residents in rural communities in between have questioned how it would benefit them. Metcalf has been an outspoken critic of the project, which at one point had the potential to go through his district in Montgomery County. Earlier this month, Texas Central revealed its preferred route, which would completely bypass Montgomery County. Metcalf said in a statement at the time that the route did not dampen his desire to see the project stopped. See here and here for some background. I don’t suppose it’s occurred to Rep. Metcalf that at least some of the train’s passengers – and it can’t be that few if the investors in TCR are correct about their ability to sell enough tickets to make money on it – would be contributing to the traffic he wants to ease if they didn’t have that alternate option. Be that as it may, it’s more than a little rich to hear any Republican legislator wax poetic about the virtues of local control. There’s a long list of things that legislators like Rep. Metcalf don’t want cities and counties to have any control over, but apparently this isn’t one of them. Go figure. Looks like Robert Eckels will have his work cut out for him convincing his erstwhile allies to not kneecap his latest project. We’ll see how much luck he has with that. Hair Balls has more.